The creature just emerges by itself, so I’m always really excited to see which one comes out. San Francisco-based artist Mariel Bayona grew up in between the border of Juárez and El Paso, right in the middle of Mexican and American cultures. Mariel is mixed herself; although both her parents are Mexican-American, somewhere down the line she has a German ancestor. 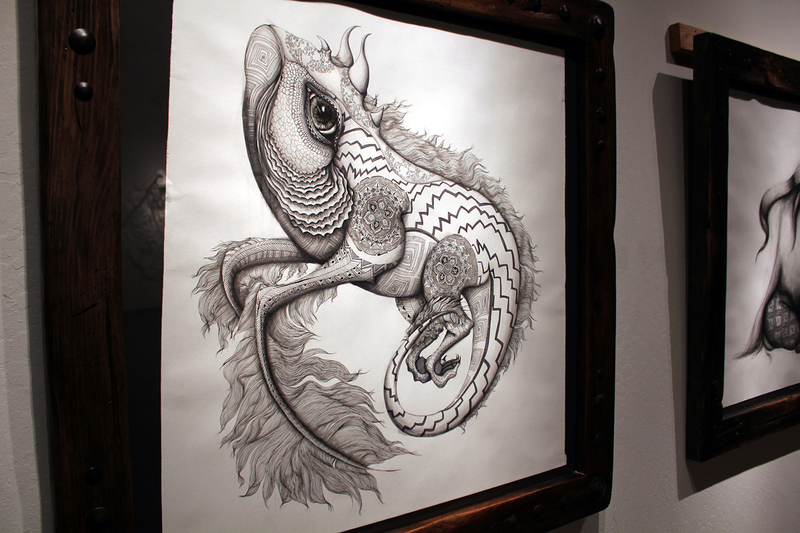 Between her bicultural upbringing and her mixed blood, she had never felt “either/or.” This in-betweenness would determine her latest work: massive pen and ink drawings of hybrid monsters. 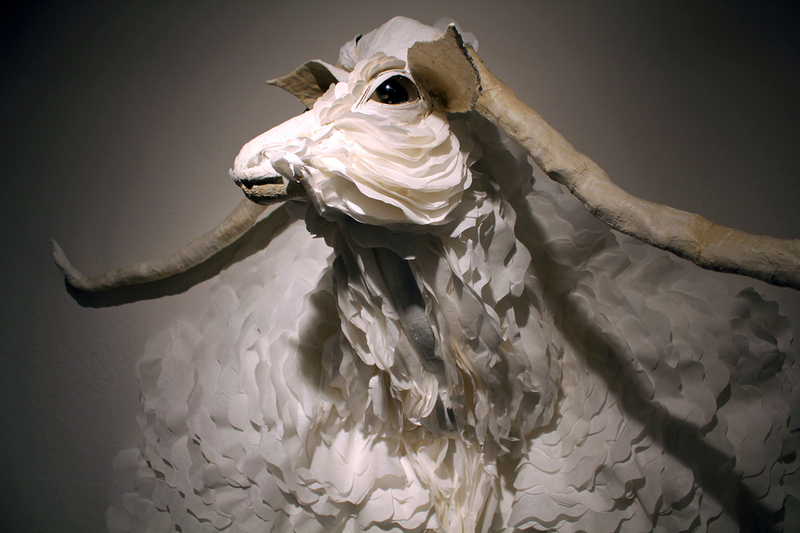 Mariel earned her BFA in Painting, although she experimented with mixed media as well. “I did my undergrad in San Antonio in an art department — it wasn’t an art school, so I was very limited with what I could do,” she says. “Texas is very traditional, [and I wanted] to experiment with something more contemporary.” So she came to California to attend the San Francisco Art Institute, where she recently graduated from. Mariel starts her practice by mounting a large piece of paper on the wall, which is never cut with a straight line or right angle. “I have an issue with border; that’s why all of my old drawings are never on a single sheet of paper,” she explains. Interestingly enough, her creatures always appear to be floating, which was a subconscious representation of her perpetual feeling of being in limbo, having grown up on the border. “The paper just starts speaking to me and that’s when my mind starts working…” She points her pencil somewhere on the blank sheet of paper and draws an eye. This is where each monster begins: from a single eye. When she starts drawing, she never knows where it’s going to end, which she finds thrilling. “The creature just emerges by itself, so I’m always really excited to see which one comes out,” she says. Some of her pieces are as large as 4 by 9 feet, but the closer the viewer looks, there are intricate details that make up the entire image. Where the creation of each animal is freehand and unpredictable, the patterns are deliberate and researched; each symbol specific to certain meanings. Once the body and shading of the creature is complete, that’s where the patterning comes into play. It’s this juxtaposition of the controlled and the uncontrolled that Mariel enjoys most about designing her pieces. “Depending on the animal or the vibe I get from the animal, I pick a certain symbol from the Aztec calendar,” she says. Take her piece “Ollin,” for example. Ollin means movement, and the symbol is in the center of every pattern. All surrounding patterns are comprised of symbols from other religions and languages that mean similar things to movement. 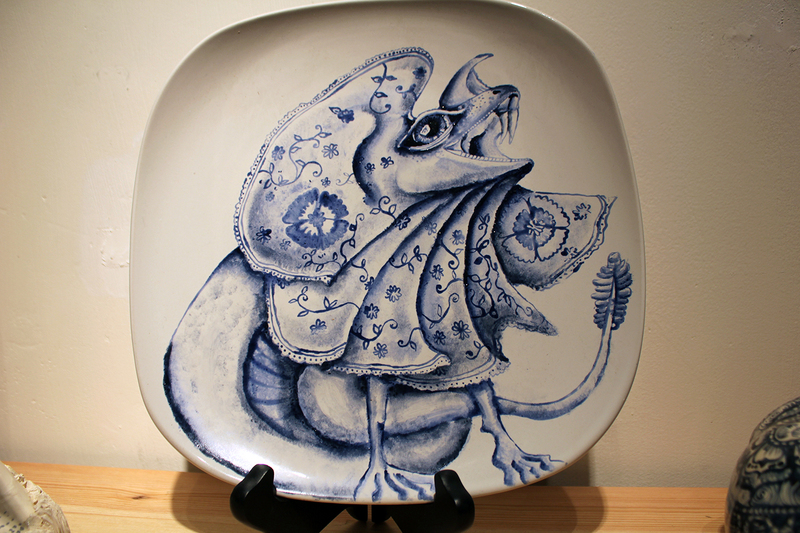 The piece speaks to the mixing of cultures and symbols, much like the creatures are a mix of animal and monster. The creatures themselves hold personal meaning for Mariel; most of them have horns, and her last name, Bayona, comes from the Spanish town Bayona, where bayonets were made. “I try to put that element in my drawings,” she says. 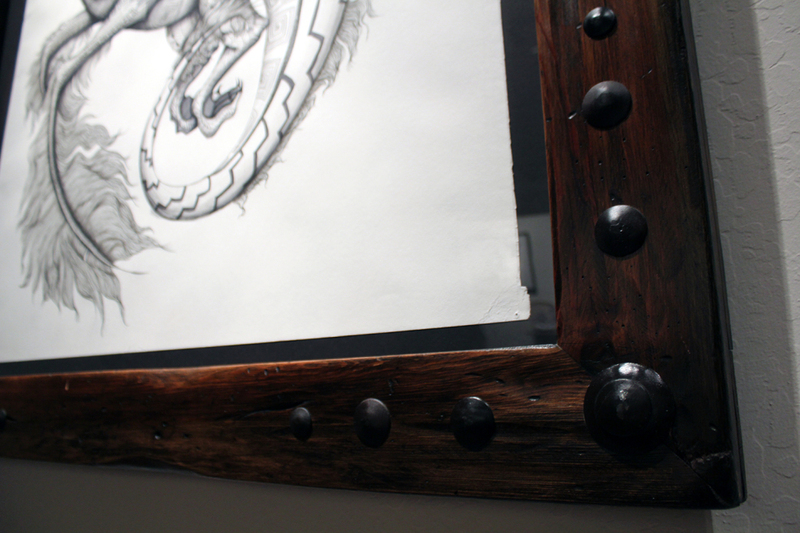 Not only are her drawings massive, but they’re held together inside huge, heavy wooden frames fashioned from salvaged antique doors by an artisan in Guadalajara called Don Tony. Mariel and Don Tony created their own system: He builds them in modular components for easy transport, then he sends the pieces to Mariel in the States, and she rebuilds them here. Each time the frames need to be transported, they must be taken apart. Feeling so limited is so frustrating. It stunts you. It got to a point where I started to feel comfortable and satisfied with the limitations that I had, and it was pathetic. Killer Creatives: When you’re not creating art what are you doing? Mariel Bayona: Right now I’m working [laughs]. Gotta pay my bills! But before that, in grad school, I loved to be active; I exercised. I’m also a huge movie fanatic; I love going to movies by myself as an escape… And for the past seven years my life has revolved around trying to get my work to another level. KC: How would you describe art school? MB: It was amazing. It’s all about experimenting. Since I was traditionally trained and limited from experimenting, I felt behind. It was really overwhelming when I first started, but once I got the hang of it I had a blast. I’d never felt so free in what I could do. It’s funny because I went back to drawing, which is a very traditional medium, but at the same time I felt I could experiment in terms of concepts; not being too traditional with the paper cutting, the edges and all those tedious rules… So just having the freedom to experiment was amazing for me. KC: What was it like not to be able to experiment? MB: Feeling so limited is so frustrating. It stunts you. It got to a point where I started to feel comfortable and satisfied with the limitations that I had, and it was pathetic. You’re in a room looking through a pretty little window with the sunshine is hitting your face, and all of a sudden they put blinds on the window. You start enclosing yourself in a little box. But I refused — I broke free! I didn’t want to be satisfied and comfortable. Some people were happy, but it wasn’t the lifestyle that I wanted — it wasn’t for me. Sometimes I miss being comfortable, but San Francisco is all about being active, [and] I’ve always regretted things I didn’t do instead of things that I’ve done, so I tell myself to just do it — experiment and experience. KC: What are you working on next? MB: Sculpture. I’m working on some commissioned drawings, but I want to focus more on sculpture. For me, just combining drawing with something different — the physical activity, the repetition of movement, the repetition of image — that meditative state is something I’m really interested in. I find that a lot in the sculpture. I think the drawing, I’ll never leave it. Even though I want to focus on sculpture, it’ll always be there. KC: Do you think that drawing is like that comfortable room? MB: Oh yeah. Oh yeah. It’s a love-hate relationship, definitely. But it’s always there, it’s addictive. KC: What advice would you give 10-year-old Mariel? MB: I would tell her to keep doing what I’ve done all my life: Just keep following your gut, always do what you feel and don’t think about it too much, because when you think too much about what you want to do, it doesn’t come out naturally and you overdo it. So I’ve always been for doing things that come out genuinely. Because in my case, when I overthink, the moment just passes. 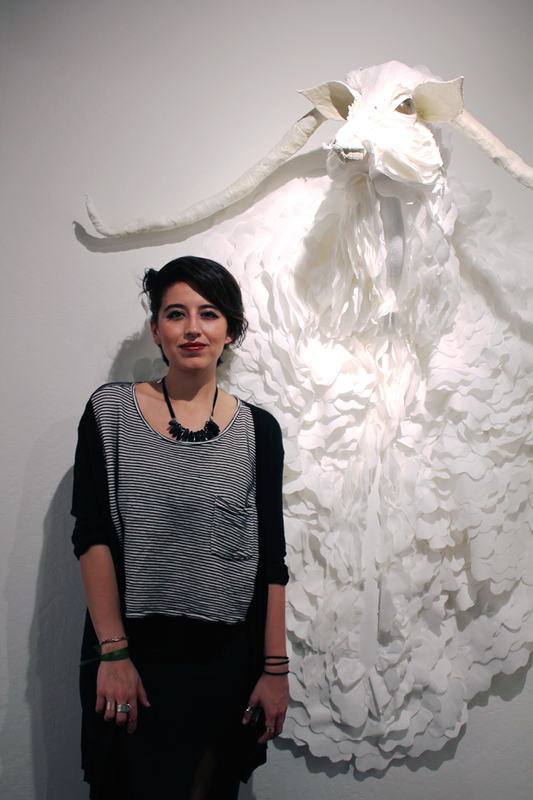 Learn more about Mariel and check out more of her work on her website.